I wandered around the garden earlier this week to see what there was to see after the snow and cold. I’m so impressed with the vitality of our plant under the circumstances! This is the outdoor thermometer. The max temperature was 75 degrees and the minimum was about -10 degrees. I don’t know if the garden really didn’t get any colder than -10 or if the thermometer was under a blanket of snow which would have insulated it somewhat. 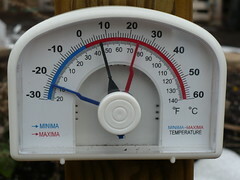 The thermometer under the plastic row cover gave a reading of 100 degrees maximum and 20 degrees minimum. We’ll talk about that more in a minute. First, let’s look at the plants that were growing outdoors, completely uncovered and unprotected (except by that nice blanket of snow). The larkspur is looking great! I think it has been growing, because it is bigger than I remember it being before the snow. We are planning to transplant it to another spot in the garden sometime soon. The outdoor spinach is looking fine as well, and to my surprise, the lettuce is also still alive! I was kind of expecting most of the lettuce to be dead and gone. 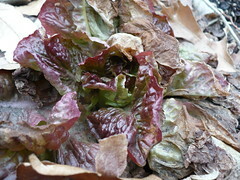 A lot of it is, but the beautiful ‘Red Cross’ Butterhead lettuce (that we chose for heat tolerance!!) still has some life to it in the very center of the plants. It isn’t exactly what you would consider “harvestable,” but the fact that it is still alive is rather impressive. It will probably grow a little bit more before it bolts this spring. Maybe enough to harvest a couple leaves, but probably not. 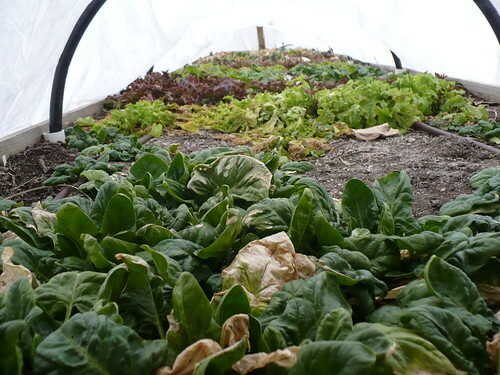 It was just a fun experiment, and it does show how much potential there is for growing lettuces in the winter if they are given more than no protection. The next thing I looked at was the garden under the plastic row cover. This bed did sustain some damage from the recent winter storm! As you can see, a couple of the PVC hoops got a bit flattened. I’m not sure if it was the weight of the snow itself or the weight of the melting snow/water that did it. I kind of suspect it was the water in the end that caused the damage. I pulled the plastic up here before I took the picture, but there was a lot of water sitting in the plastic. The plastic wasn’t tight enough for the water to just run off, so it pooled crushed the hoops. 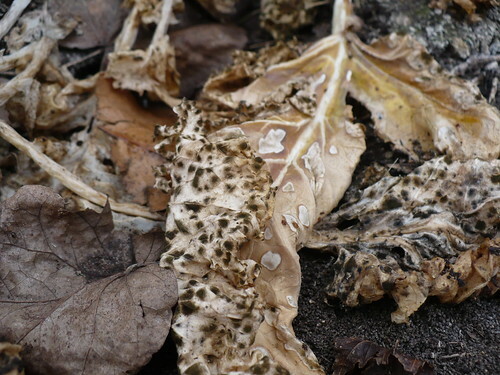 I think the conditions under the plastic tunnel have been too humid and too warm for parts of the winter, resulting in the growth of this beautiful fungus seen above on some dead kale leaves. 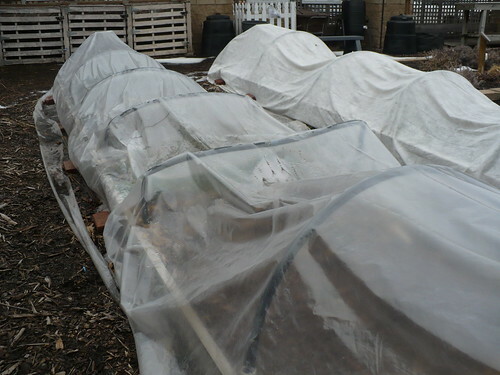 The plants under the plastic don’t look nearly as good as those under the fabric row cover, and most of them are supposed to be more cold hardy! 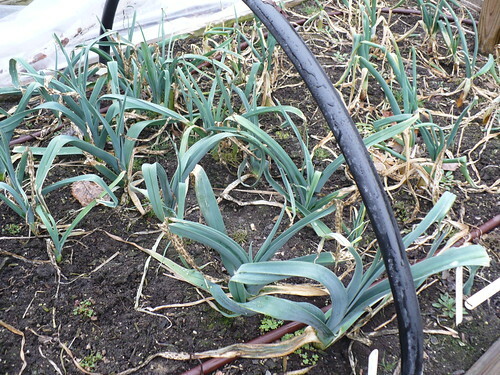 The leeks and onions aren’t looking terrible, but they have some diseased leaves too. Meanwhile, under the fabric covered hoops, things are looking pretty good. There are some dead leaves here and there, but I think some of this lettuce and spinach could still be eaten! The moral of this story is that you should only use plastic for row covers if you are going to be able to vent the plastic on warmer, sunnier days. 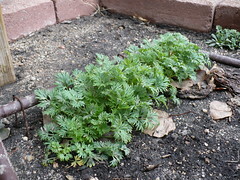 Posted on February 18, 2011, in Around the Garden, Season Extension Gardens and tagged spring garden, vegetable gardening, winter garden. Bookmark the permalink. Leave a comment.